George Jolevski was a brilliant junior player who went on to have an equally successful senior career, though he did not receive the national recognition his efforts perhaps warranted. He was born in Melbourne in 1969 and joined Preston Makedonia in 1985. 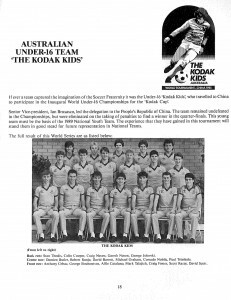 That year he went with the Australian team to the inaugural World Under-16 Cup in China, where Australia put on a superb performance, beating both Argentina and West Germany, as well as Congo, in its group. The fairy tale came to an end in the quarterfinal after a goalless draw with Guinea and a cruel loss on penalty kicks. As a result the Joeys were rated seventh in the world at their age group. 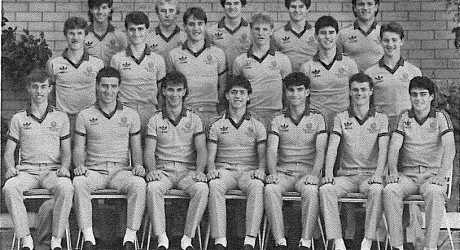 Australian Under 16 squad 1985. Australian Soccer Federation, Annual Report, 1985, p. 18. Two years later Jolevski toured New Zealand with the Australian schoolboys. That year, 1987, he started in the first round for Makedonia against JUST at Schintler Reserve in another scoreless draw a few days after his eighteenth birthday. Preston finished second in the league that season behind APIA Leichardt. In 1989, the last winter season for the NSL, he was ever present for Makedonia as they finished in 5th place but went out to Melbourne Croatia in the elimination final. Jolevski played three games for Australia in defence in 1990 during which the team scored eleven goals and conceded none, yet he did not win a full cap for the national side and hence does not appear in the official list of Socceroos. 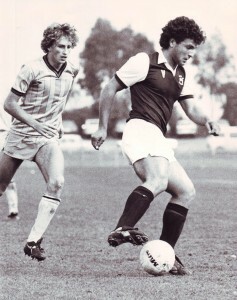 George Jolevski (right) playing for Victoria. Photo: Laurie Schwab collection, Deakin University Library. Preston began to go backwards in the NSL and Jolevski left for Sydney Croatia followed by spells at Kedah in Malaysia and with Rockdale Ilinden in the New South Wales State League. George Jolevski then joined Marconi for the 1992-93 season helping the club to second place on the ladder behind South Melbourne Hellas but going on to beat Adelaide City in the Grand Final by an Andrew Harper penalty. So he now had won the national title and the following season he assisted Marconi to fourth on the ladder but Adelaide City reversed the result of the previous year in the semi-final and went on to beat Melbourne Croatia in the final. In 1994-95 Jolevski returned to Melbourne to join the rebadged Zebras but he could not prevent the club finishing third from the bottom and being relegated. So George was off on his travels again this time to Wollongong City but they were also struggling before beginning their climb up the ladder. So it was back to Melbourne to join Collingwood Warriors for their single season in the NSL. A Cup win and a three-nil demolition of the Knights in the first league match in front of 10,000 fans at least proved a false dawn for the club. Jolevski appeared nine times as a starter, but then dropped down a level to the Victorian Premier League in 1997 with Thomastown and then switched to Altona Magic later in the season and won the Gold Medal as the best player in the competition. He repeated the feat in 1998 at Thomastown and again in 1999 at Melbourne Raiders. The new decade saw Jolevski back at Altona Magic, then he went to Essendon Royals and Port Melbourne Sharks in 2002. 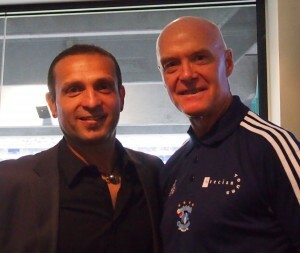 Triple Gold Medal winner and Socceroo George Jolevski is now Coaching Director at Bundoora United. Last week at the launch of the 2013 Victorian Premier League he said he is implementing development programs throughout the club and he was bursting with enthusiasm for the chance to implement some of the ideas he has imbibed in his stellar career. George Jolevski playing for Victoria as a youngster. Photo: Laurie Schwab collection, Deakin University Library. 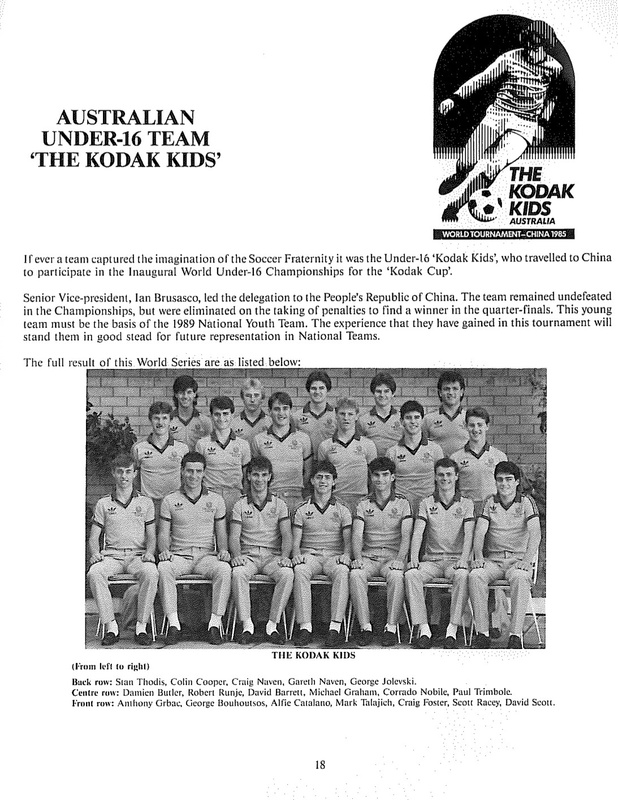 Australian Under-16s in 1985. Australian Soccer Federation, Annual Report, 1985 p. 18. George Jolevski for Australia (?) in 1990. Photo: Les Shorrock, Les Shorrock collection, Deakin University Library. George Jolevski today with Franz Wimmer. Photo: Roy Hay.